This week Dr. Scott Miller guest-hosts the show and leads a discussion about prostate cancer awareness and the upcoming Blue Ties fundraiser. Innovative surgeon, composer, author, medical expert, educator, and patient advocate. Colleagues and patients alike have recognized Dr. Scott Miller for his achievements and excellence in care. He has received some of the highest accolades in his field including Top Doctor by U.S. News and World Report, Top Doctor by Castle Connolly, and numerous Patients’ Choice awards. Scott D. Miller, M.D. 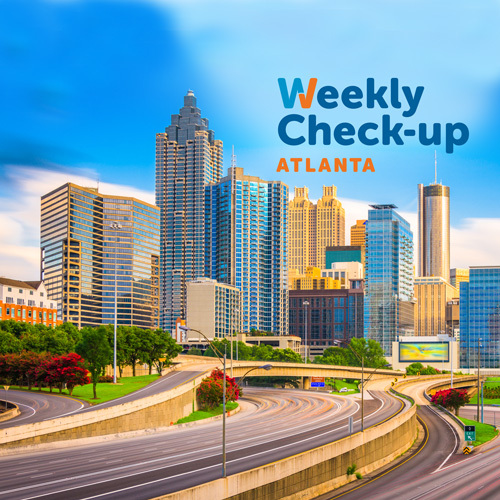 arrived in Atlanta in 1995 and quickly established himself in the medical community as an expert and colleague ready to help both patients and other healthcare providers. As the state’s first urologic laparoscopist, he soon became a known advocate for the reduced invasiveness, faster healing and minimized complications inherent in the “Band-Aid surgery” approach. Whether teaching other surgeons from across town or around the world how to perform these techniques, or using the same methods to get patients out of the hospital and back on their feet sooner, Dr. Miller has a consistent philosophy: focus solely on the special needs of laparoscopic urologic surgery patients and perfect his techniques in order to deliver the best possible care. He currently has one of the largest and most diverse experiences in laparoscopic and robotic urology in the Southeast. Early 1990s – While in his residency (his program was an early adopter of advanced urologic laparoscopy techniques), Dr. Miller lays the foundation to become one of the first urologists to perform these procedures on a large scale outside of an academic center. 1995 – Performs the state of Georgia’s first laparoscopic kidney removal for kidney cancer. 1996 – First in Georgia to perform a successful complex reconstruction of the urinary tract (pyeloplasty and ureteral re-implant) via laparoscopy. 2000 – Completes Georgia’s first laparoscopic prostate removal without robotic assistance. Less than 1% of urologists have completed one successful prostate removal in this manner, let alone several hundred, as in the case of Dr. Miller. 2003 – Conducts Georgia’s first prostate removal using a robotic surgery system. 2005 – Develops the S.P.E.C.I.A.L™ (sequential pre-emptive exposure of cavernosal innervation with atraumatic ligation) surgical technique for preserving nerve function after prostate removal, which improves post-operative erectile function. Not only does this technique protect the essential nerve bundles, but also the surrounding neural structures and supporting tissues prone to injury from the slightest manipulation. Present – Performs more than 250 various robotic surgery and laparoscopic procedures every year, and continues to provide education to other physicians through peer-reviewed journal and book chapter publications, hands-on teaching, and scientific presentations. He is also an accomplished musician and composer who has written a variety of songs (including a new one about the emotional impact of a cancer diagnosis). Dr. Miller is an active member of many professional societies including the American Urological Association, the Society of Laparoendoscopic Surgeons, and the Endourological Society. He has been Board Certified by the American Board of Urology since 1997. Dr. Miller graduated from the Medical College of Georgia and completed his urologic residency at the University of Kentucky Medical Center.